Geofencing, as a function within OSINT research, is the creation of a virtual “fenced” geographical area that allows for the collection of information within that area. One of the most important skills a partisan needs to have is the ability to collect and analyze open source intelligence, or OSINT. In fact, the importance of knowing the who, what, where, when, and why of everything going on in your area of operations cannot be overstated. When it comes to the where part of the equation, geofencing is an invaluable tool. This fence line, now effectively a form of box, can now be used to search for specific objects inside the enclosed area, or identify when specific objects move into or out of the enclosed area. Other capabilities include being able to be set up the box as passive (observing something at a later date), monitored (seeing something has it happened), or automated (receiving a notice that something has happened). As examples, it can be used by security personnel to identify when an electronic device carried by a person enters a specific area; it can be used by marketeers to send a potential customer advertising when that customer is in close proximity to a specific retail outlet; or, it can be used during sports events to track the positions of tagged athletes in the competition area. You can easily see the use for our purposes—especially if you’re involved in Intelligence Preparation of the Community like you should be (read Sam Culper’s book NOW, if you haven’t). There are tools for creating geofences and collecting information within them. For this article, we’ll focus on one specific free service available. How Can I Get Started Geofencing? You can even get a sense of spreading civil unrest, or general attitudes of various demographics within the area. If you live in an area where there’s recently been a police shooting, for instance, social media posts can give you an idea of how the populace is reacting. 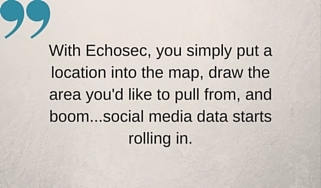 There are a hundred other uses for tools like Echosec; just use your imagination. It’s easy to use, free, and a valuable tool in your arsenal of intelligence collection. (Note: The free version is, understandably, limited. If you choose to upgrade to the Pro version, you’ll have a far bigger field to research within but it’ll cost you $89 per month.) By the way…when you see how many photos of people’s kids, homes, and personal details are easily obtainable by anyone, you might rethink that next Facebook post about your little cherubs. We’ll be going over this and other tools in an upcoming class. Stay tuned for details! Have you used Echosec? Do you prefer another geofencing tool? Let us know in the comments!